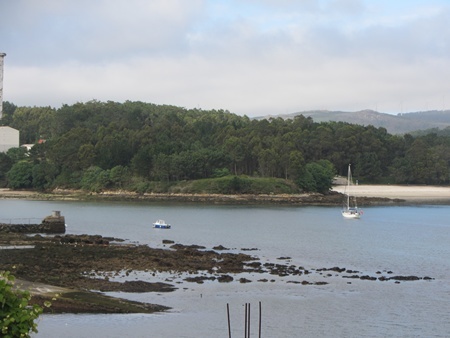 Although we had hoped to round Finisterre yesterday, the wind dropped quite quickly and as neitgher of us enjoy motoring, we turned into the next Ria and anchored off another sandy beach just past the town of Camarinias. The sun came out and it was hot!! After a very relaxing (but too hot) hour in the cockpit, D spied another Bowman anchoring off the town. He was in he dinghy in a flash and ready to row the 1/2 mile to say hello. I was just about to have a swim so I declined, thinking that he'd be back in about 15 mins. 2 hours later he returned! 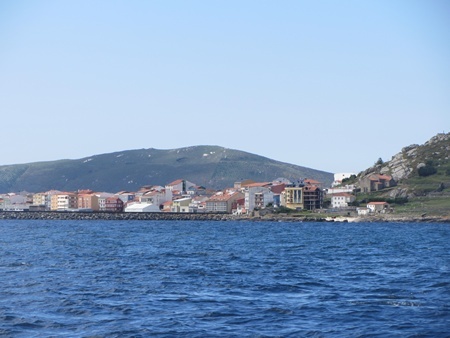 We did then manage to have a look ashore, a wander around the town and a beer in the Club Nautico, associated with the marina. 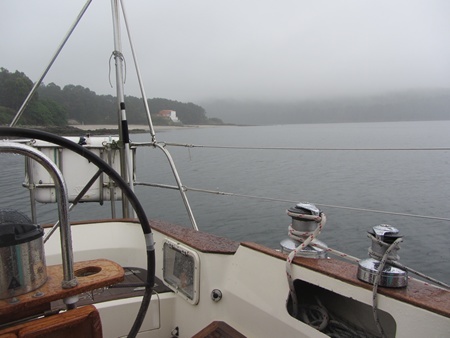 Here we enjoyed socialising with the several other sailors, stopping off on route to their various destinations. (In Spain, when you have a beer or coffee, at some stage you are given a variety of tapas to go with your drink. This is just how it is, no charge.) Returning later to the boat, D spied a barbeque being prepared at one of the little cafes. An hour later we were enjoying sardines. Delicious. The following day it was raining again. We waited until we thought that it was less heavy and rowed ashore again for supplies in the well stocked supermecados. The weather by now was getting a little frustrating as we love to explore on foot and had so far been severely restricted. Wetsuit swims in the rain were becoming the norm.